of return on investment ofany in the garden! The Head Gardener and I are cautiously optimistic that we have seen the end of 90+ degree days ... we're not celebrating just yet but give us another week and we'll break out the good champagne and congratulate each other on having survived another summer. It was touch and go there for a few days in early October after a trip to San Francisco had us fearing our ability to tolerate hellacious heat & humidity had been forever compromised. 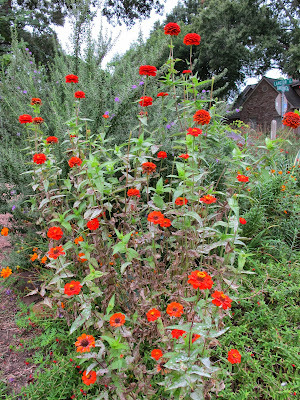 But what a difference rain and cooler temperatures have made in the gardeners and the gardens of Wit's End! Smiles are plentiful and blooms are bountiful! 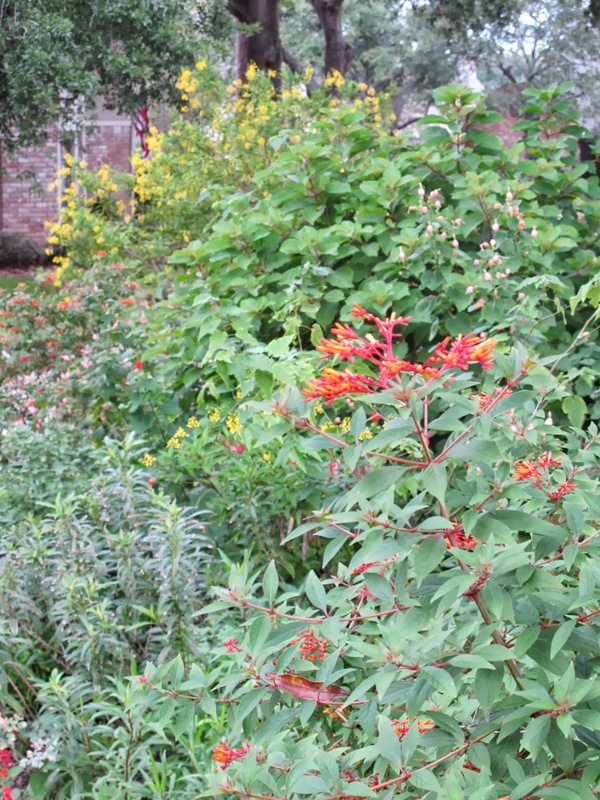 Here's a sampling of the latter for Garden Bloggers' Bloom Day. The ex-Asters are in full and glorious bloom. bed with Rock Rose and Pink Muhly Grass. The purple Salvia 'Amistad' has been spectacular. That's white lantana in the foreground. 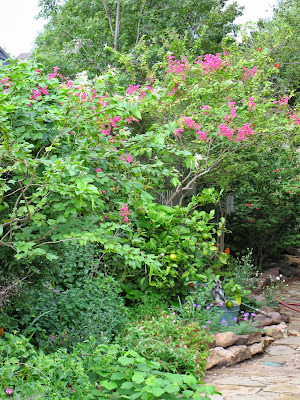 It's been a good year for the coral vine. are the dominant plants in this picture. Pink Muhly Grass ... and more! 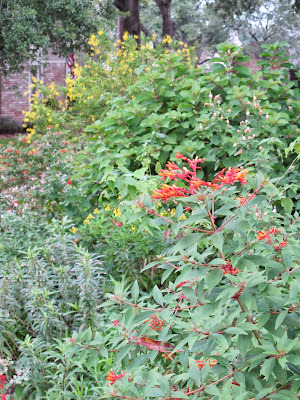 Calylophus, Lantana, Turnera ... and more! These zinnias keep pumping out the screaming red-orange blooms. for the eyes this year. Giant aloe, spiderwort, coneflowers ... and more! 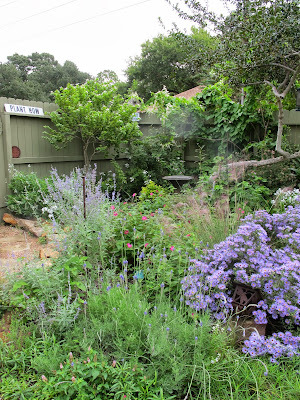 Garden Bloggers' Bloom Day is hosted by Carol of May Dreams Gardens on the 15th of each month. Thanks, Indy Gardener! I have heard several people talk about Amistad. It looks as though yours is in full sun although I heard that it does better with some shade. I think I would like to try it next year. The buttercream cassia is beautiful. Everything is beautiful and as you say I think we can finally breathe again. I love the buttercream cassia, too. Maybe your Amistad is happier because you get a little more water. The whole garden looks gorgeous. 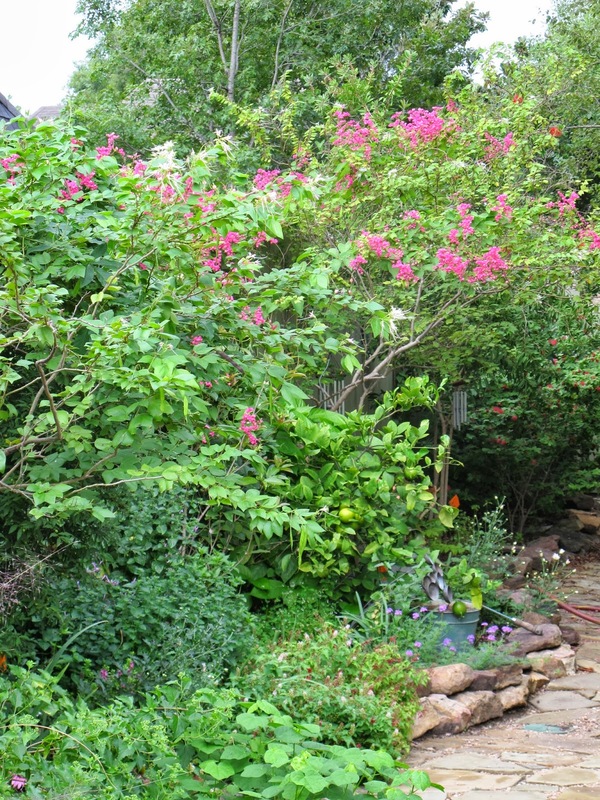 Your garden is so full of color and looking so lush, Cindy! That lantana is amazing--I wish there was a hardy version for us Northeners. About the time mine gets really full and looking good (nothing like yours, of course! ), we get hit with a hard freeze. Glad you are finally able to enjoy your garden in this milder weather, Cindy; I'm envious, as frosty nights here mean an end very soon to most of my garden. Your asters are really nice! The best I've seen in a garden bed around here. What is the shrub in the last picture with the lemony foliage - Cuban Gold Duranta? It looks beautiful, whatever it is! Thanks for sharing! Trying to keep my envy in check. Tell the Head Gardener, "Brava!" I don't even recognize most of the plant names, much less the plants, but I do recognize that aster and it is spectacular! Ditto the lantana. If you could see mine, you would wonder if I just bought it as a seedling.